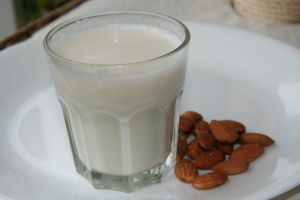 Almond Milk is a divine food recipe for a healthy alternative to milk. In a blender, grind almonds to a fine meal. Add 1 c of the water and the maple syrup. Blend again for 2 minutes. With blender running on high, add remaining water slowly. Blend for 2 more minutes or until creamy. Pour through a very fine strainer or layer of cheesecloth. Keep in the refrigerator in a glass jar or airtight pitcher.